Select necklaces and pendants are 25% off in my Etsy shop! With the holidays over and a new tax year beginning, I would love to buckle down and get a lot of new items in my Etsy shop. What do I have planned for this year? First, expect a lot more earrings. I got a great Dremel rotary tool for Christmas, and it will make churning out ear wires a snap! These cup burrs are en route from WidgetSupply.com and should cut the amount of time I spend on each wire down by a huge percentage. (Hand filing those babies takes a long time, and I always manage to nick my fingernails in the process.) The 1.2mm size is just right for 20 gauge wire. I will also be doing a version of my tassel earrings in customized sports team colors, starting with scarlet and gray, of course! I gave out a few of the first pairs as Christmas gifts this year. They’re like little pom-poms for your ears! If I’d been more prepared, I would have had a Black Friday/Cyber Monday sale over at the shop…alas, that will have to wait for next year. For now, free shipping for the month of December will have to suffice! Use coupon code VBFREESHIP at checkout to take advantage. This applies to domestic shipping only. Happy holiday shopping! "Jegging" is an abomination of a word! Ok, so I’m a 30-year-old mom. Not exactly your idea of a fashion plate, right? That doesn’t mean I can’t participate in a few trends now and then! 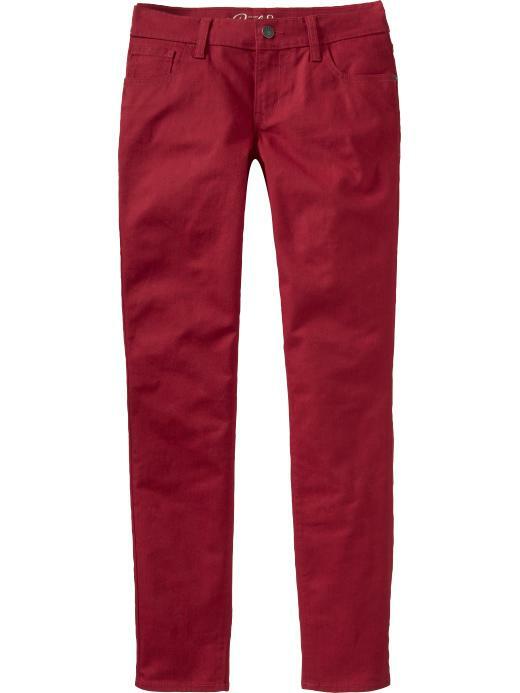 One of my favorites for this fall is brightly colored denim. Now, being a currently unemployed mom means I can’t really justify shelling out $252 for these red jeans, but luckily, Old Navy has my back. I wasn’t sure if I could pull them off, but when I put these jeans on, I feel like one hot mama! They don’t seem to be selling these online anymore, but I’m certain they’re still in stores, and they’re under $40. Do be aware that these things run SMALL – I had to buy 2 sizes up. So anyway, these things look amazing with my tall black boots and a simple black and white striped t-shirt, but after my husband insisted I was stealing Michael Jackson’s color scheme, I decided I’m going to have to go out on a limb and try something other than black. Another trend I’m loving, and I touched on this one a few days ago, is tassels. 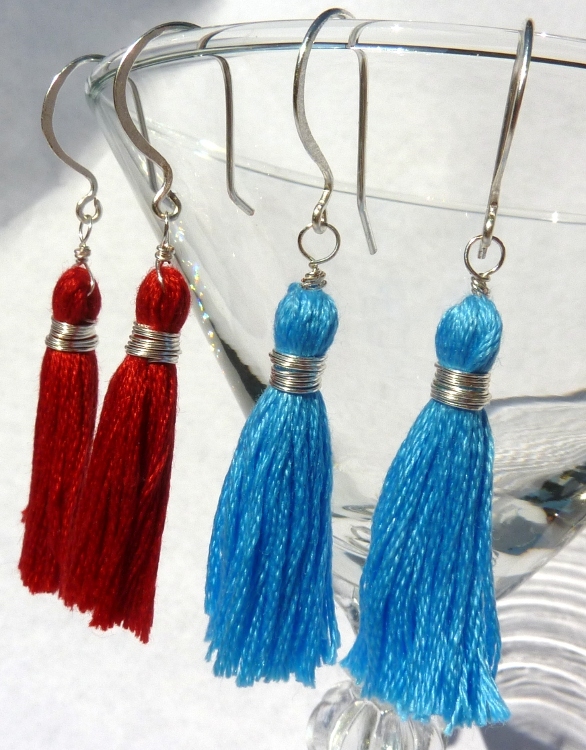 The tasseled loafer and purse thing is just not for me, though, so I combined trends and whipped up these brightly colored tassel earrings in crimson and bright blue. I think I’m going to have to make a pair of these in every color of embroidery floss I can find! I guess this is as good of a time as any to post the big news that (as you may have guessed from the link above) my Etsy shop is now open for business! I am super excited to see if people like the stuff I’m creating! So take a quick peek if you like – I’m in need of some constructive criticism! I’m working furiously on getting everything in order for the shop, but I’d like to take a minute to post a few of the items I’m most excited about. 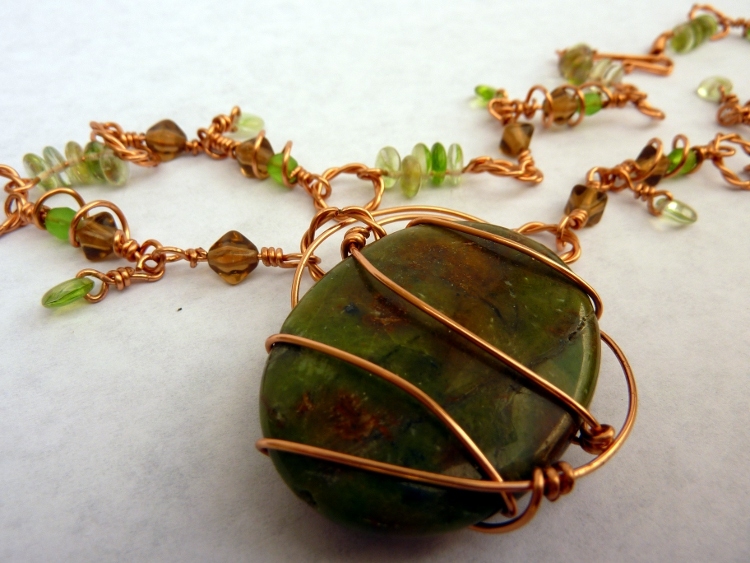 All the wirework in these items was done by hand – chains, clasps, findings, everything! 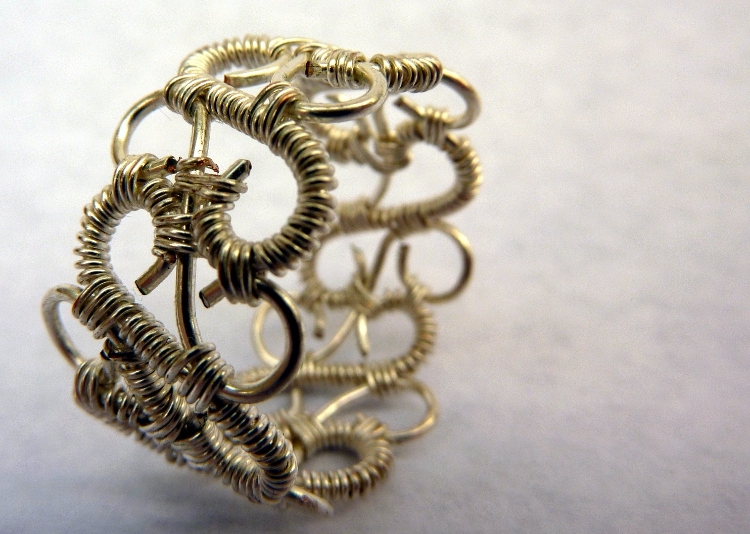 The robin’s nest ring is one of the first things I made after starting to work with wire. I love the aesthetic but it’s a little too big for me to wear – just not my style. 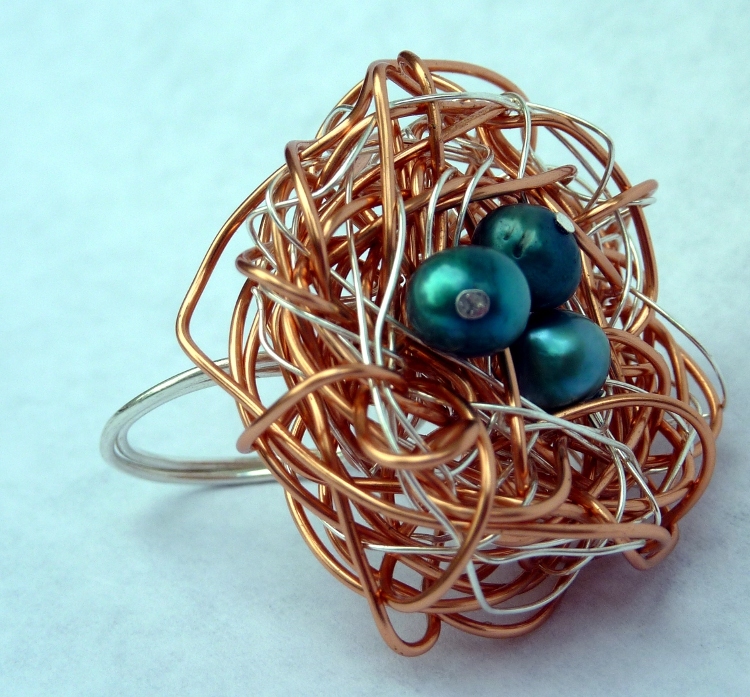 This ring was inspired by a bracelet I liked. Wrapping all those curves took forever! 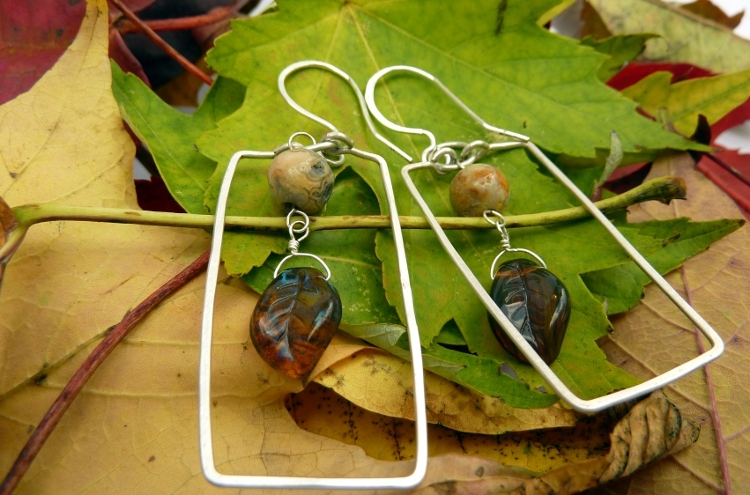 I love these Falling Leaves earrings, and I get lots of compliments on them. Hammering the silver frames really gave them a cleaner look! I made this necklace for myself after finding the large bead in a bead store bin. 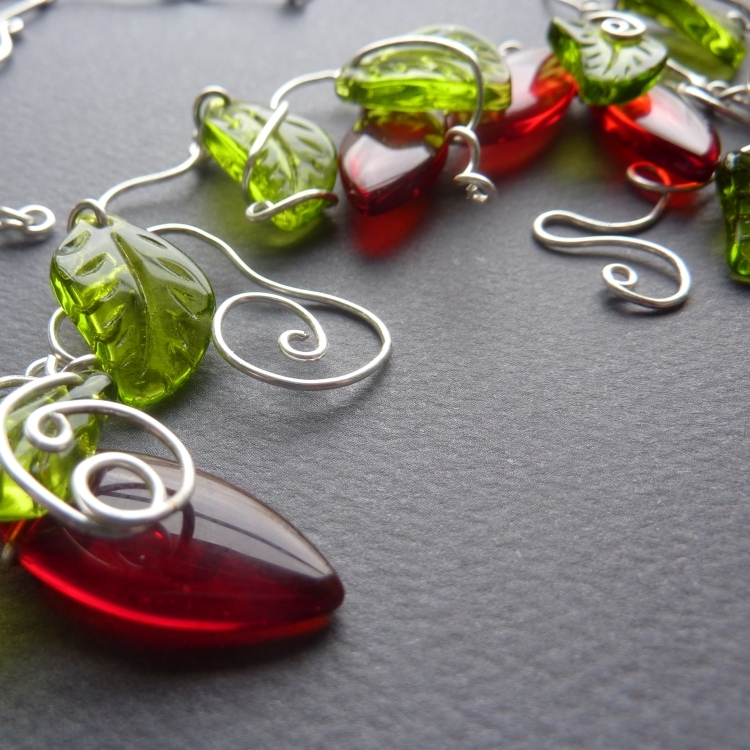 It reminds me of a redhead with green eyes, hence the title – Redhead Necklace. I also have matching earrings. I’m a little hesitant about selling this one! 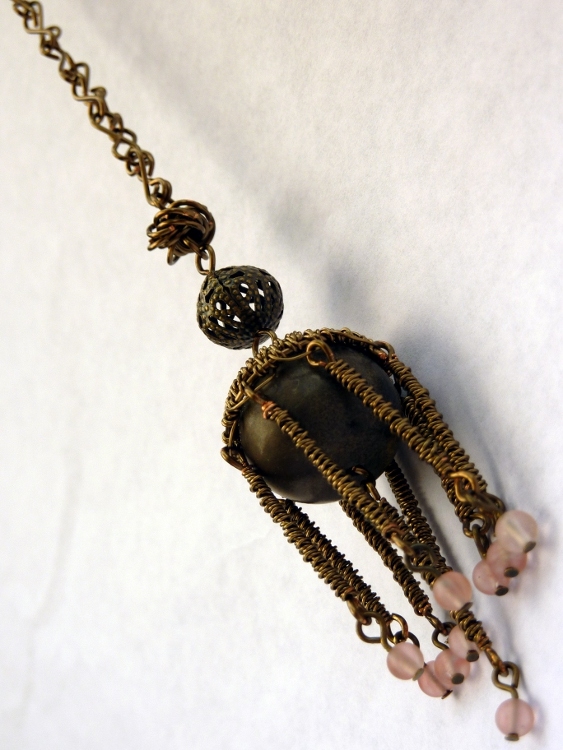 This is the first item I made specifically to sell, and the one I most recently finished – the Thebes Tassel necklace. Inspired by the tassel trend we’ve been seeing all year, I wanted to try my hand at making one of wire. In the end, it reminded me more of an Egyptian headdress of some sort, so I named it the Thebes Tassel.